Kirk and I did something big on Thursday morning… we went downtown and got our marriage license! About a week ago we planned that we would each take a work-from-home day this past Thursday so that we could go downtown to the Daley center and stand in line to get our marriage license. So, Thursday rolled around and we got up early, went for a quick run, came home and got ready, and took the train downtown. We got the marriage licensing office about 5 minutes before they opened… which meant no line 🙂 As soon as the office opened we went in, answered all of the necessary questions, showed our IDs, and gave the woman behind the desk $40. After leaving the office with our marriage license in hand, we left the building and decided to take a walk around the Daley Center Farmer’s Market (which I didn’t even realize happens on Thursday mornings every week during the Spring, Summer, and Fall). It was a beautiful morning – the sun was shining, the sky was blue, it was about 68F, and there was a nice breeze. We stopped at nearly every stall, and ended up coming home with a ton of stuff. We bought a 2lb wheel of Amish butter, a block of cheddar cheese, a ball of mozzarella, a bag of fresh cheese curds, 3 jars of salsa (mango lime, portabella mushroom, and cheddar garlic) 5 Honey crisp apples, a huge bunch of fresh basil, a small bag of grape tomatoes, 2 pints of Saturn peaches (the most delicious peaches ever), and 4 sesame bagels. We haven’t really broken into the cheese, butter, and salsa yet, but as of tonight the tomatoes are gone, 5 of the peaches are no longer with us, and two apples have been enjoyed 🙂 And… all of the bagels have disappeared. This is my favorite time of year at the farmer’s market. Honey Crisp apples and Saturn peaches are my favorite fruits ever. Seriously – if you haven’t tried either then you need to get out and find them. really…. get up from your computer right now and go find these fruits. Honey crisp apples are super crisp and crunchy (you’d never know it by their name…), juicy, a little tart, but mostly sweet. If I could get these apples year-round, I would definitely eat an apple-a-day. These apples are so amazing that they have me dreaming about starting an orchard. Yes, they’re that good. As for the Saturn peaches… don’t even get me started on those. They look a little strange (they are often called “donut peaches” because they look like donuts), but they have a rich flavor that you really won’t find in any other variety of peach. Also, their skin is incredibly soft and supple, which makes for a slightly more pleasurable eating experience. My goals for next weekend is to hopefully find a few more pints and make some preserves (or possible fruit leather) so that I can enjoy their flavor through the winter. Anyway, as wonderful as it is to encounter some of my favorite seasonal fruits, it’s equally as wonderful to be reintroduced to one of my favorite kinds of bread: fresh bagels. There was a small stand at the farmer’s market that I almost passed over, but Kirk convinced me to stop and look. I should point out that I’m always a little skeptical about buying bread at a farmer’s market, not because I don’t think it will be good, but because I’m pretty good at baking my own bread at home. And when I know I can make something, my preference is usually just to make it rather than buy it. But… the bagels looked good, and I wasn’t sure when I would next feel like baking bread, and Kirk and I were going to need something for lunch. So, after debating the merits of everything bagels versus plain bagels versus sesame bagels, we decided on a pack of 4 sesame bagels. In the bowl of a stand mixer, mix together the yeast, sugar, and water. Let it stand for 5 minutes. In a large bowl, mix the salt and flour together. 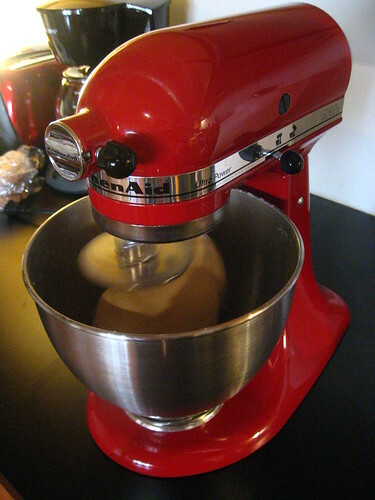 With the mixer on low speed, slowly add the flour in four batches (i cup per batch). The flour should be mixed into the liquids before the next addition of flour. Once all of the flour/salt has been incorporated, turn the mixer to medium speed and knead the dough for ten minutes (the dough may look somewhat dry, but as it is kneaded the moisture will incorporate any remaining dry flour). This dough should be very firm, so don’t worry if it initially seems like a lot of flour. The dough is ready (you no longer need to knead it) when it is firm, smooth, and slightly tacky to the touch (but not sticky). Place the dough in a lightly oiled bowl, turning it several times to coat the dough with the oil. Cover the bowl with plastic wrap and let the dough rise until it has doubled in size (about 1-1.5 hours). When the dough has completely risen, punch it down and let it rest for 10 minutes. After the dough has had a chance to rest, roll it into a log and cut it into 8 equal pieces. Shape each of the 8 pieces into a ball, and then punch your finger through the center of the ball to form a hole. Work the hole until it’s about 1/3 the diameter of the bagel. 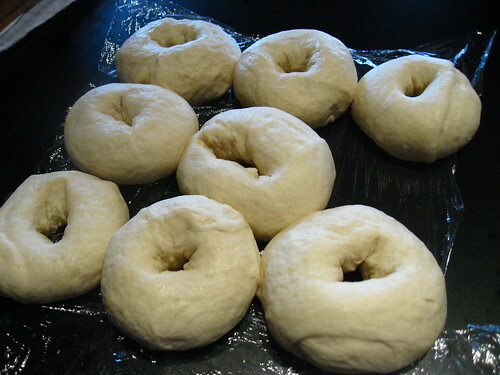 Place the shaped bagels on a baking sheet and cover with plastic wrap (or a miost towel) and let the bagels rest for 10 minutes. Preheat the over to 425F, and bring a large pot of water to a boil, and prepare a large baking sheet by either oiling it or using a silpat silicone baking mat. 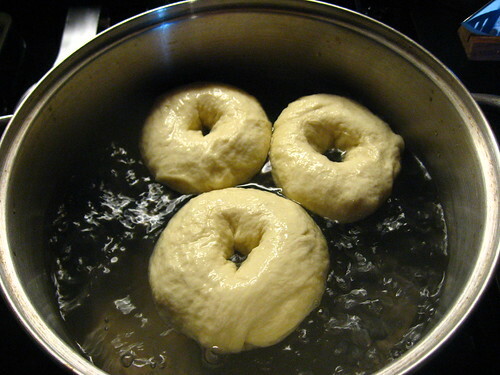 After the bagels have had a chance to rest, place 2-3 bagels into the boiling water for 1 minute, turning once. 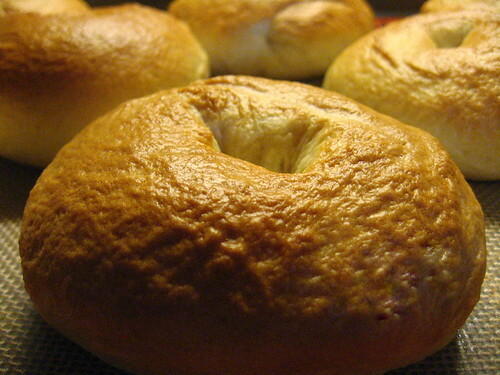 Remove the bagels from the water with a perforated skimmer and place them on the baking sheet (a large baking sheet should hold 8 bagels… bagels don’t really expand when they’re baking, so you can place them pretty close to each other). 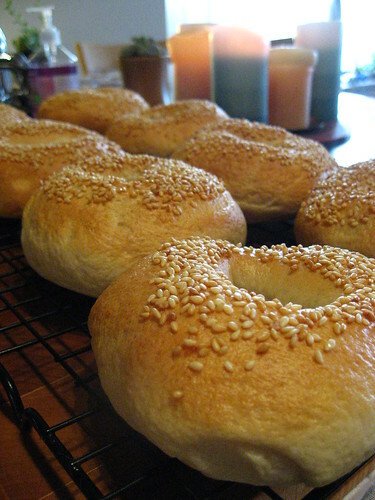 Optional: For the first batch I sprinkled the bagels with sesame seeds, but for the second batch I left the bagels plain. 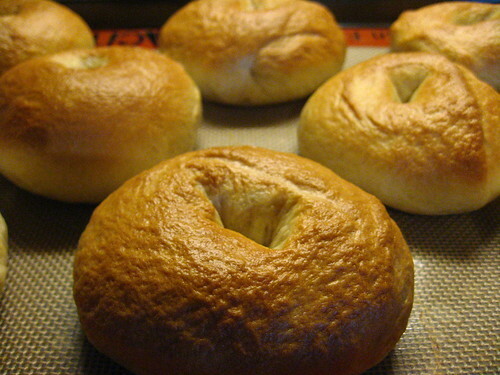 Remove the baked bagels from the over and place them on a cooling rack. These can be frozen (if you want them to last longer than a week) – just thaw them a day ahead in the fridge and let them come to room temperature before eating. 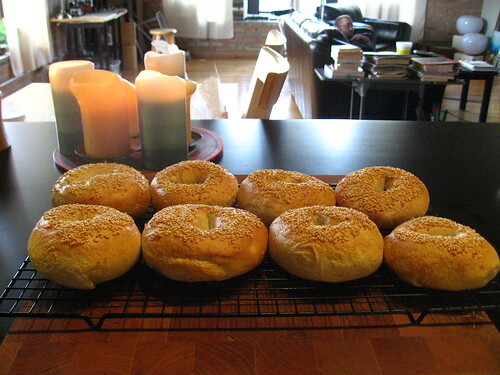 My experience has been that homemade bagels tend to keep for about a week in a plastic bag/bread bag (I have a fancy plastic-lined bread bag that I like to use for homemade breads).